Washington Wizards won both meetings at Toronto and defeated the Raptors 106-99 home at Verizon Center Friday night. They have a chance to finish off Toronto in front of their home-fans to win their mere fourth playoff series in the last 35 years. The Raptors will be looking to become the first team in NBA history to overcome a 3-0 series deficit, starting with a win tonight. Toronto shot a woeful 37.4% from the field in Friday’s loss with Kyle Lowry going 5-for-22 and a total of 15 points in the game. He’s only 3-for-16 from 3-point range while averaging 9.3 points in the series. Demar DeRozan carried the Raptors with 32 points over 41 minutes while Amir Johnson shipped in 14 points and dragged down 12 rebounds. Washington was far more effective than Toronto shooting 47.4% from the field and going 12-for-29 from behind the arc. Six players reached double-digits for points with Martin Gorcat leading the team with 24 points and 13 rebounds. 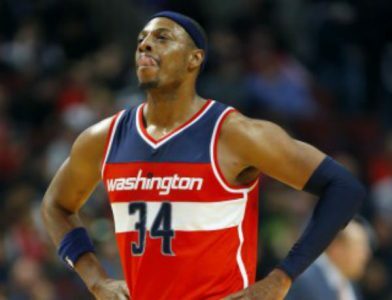 Paul Pierce logged only 27 minutes but still managed 18 points and has made 10-of-18 3-pointers in the series while John Wall dished out a team-high 15 assists. The Raptors are 0-5 ATS in their last 5 games overall and 0-4 ATS in their last 4 games following a ATS loss. The Wizards are 8-1-2 ATS in their last 11 games overall and 5-1-1 ATS in their last 7 games following a S.U. win. There’s just too many factors in the Wizards favor here and a play on the hosts to cover the spread is warranted.